Our biggest section in Picture Book City is and will likely continue to be the Favorites section. It’s where we are putting all those popular characters like Dora the Explorer and Disney. So far it’s been the easiest section to determine and doesn’t require a ton of input from me since we already shelved our character books under “J-E FIC DOR” or “J-E FIC DIS.” My staff has been able to work on this without my direct input, which has been super helpful. I did decide to continue using the character’s name in place of the author last name on the spine label. That way whoever writes a Dora media tie-in will be shelved with all the other Dora tie-ins. But this section is also for authors that I don’t want to split up. I’ve already designated Kevin Henkes, Lauren Thompson, Mo Willems, and countless other authors to this section. This is what my staff worked on while I was at Midwinter and I came back to eight full shelves completed! 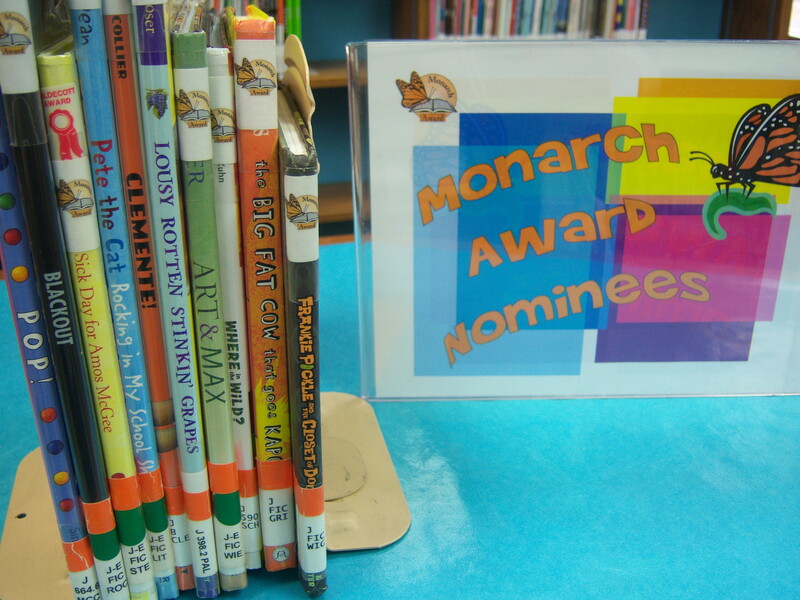 I also pulled our state awards, the Monarchs, for Favorites / Awards as well. I struggled here since we only have seven winners so far. I wondered if I should include the second and third place winners to beef up this area. Ultimately, it made more sense to think towards the future when we’ll have 75 winners there too! One of the most important things that I kept in mind while working on this section was whether it was a favorite of the kids/patrons or if it was a favorite of mine. So, even though I love Antoinette Portis, I separated out her books since the kids/patrons would benefit more from seeing “Kindergarten Diary” in Growing Up / School. I’m still finding a few more books to add as I go through the rest of the books, but I think that overall, we are mostly done with Favorites. 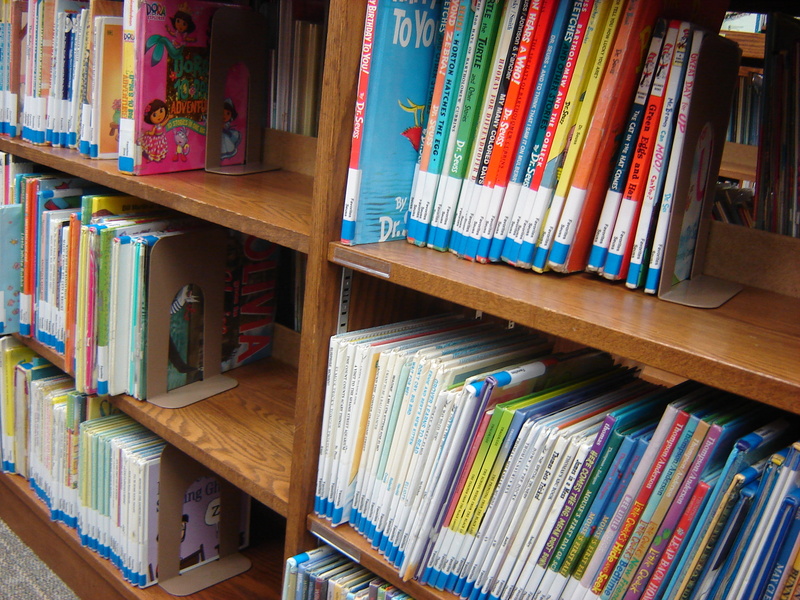 Coming up on Picture Book City — what happens when a new box of books comes in? How do they get processed? Tune it next week! Interesting. I’m in the midst of sorting my library’s picture books into similar “neighborhoods”, and I decided not to do a “Favorites” section. One of the reasons was the question you brought up – is it a kids’ favorite or one of mine? I constantly keep asking myself that. But after six and a half years here, I do know what characters/authors the kids continually ask for. I tried really hard to only limit myself to those title or classic books that the school uses (Mike Mulligan, Millions of Cats, etc.) for assignments. What did you do with Eric Carle? He went into Favorites. The kids at my library absolutely worship Carle!